To evaluate the relationships between acromial anatomy and developmental alterations with rotator cuff tears in female patients and compare these parameters on radiographs and corresponding MRIs along with inter-reader performance. 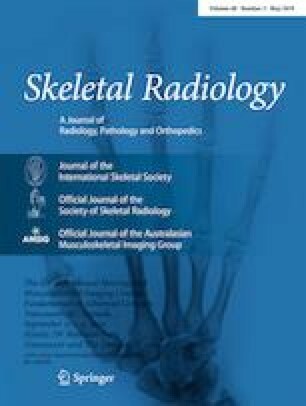 Patient demographics, symptoms, and acromial characteristics on radiograph (acromial index, lateral acromion angle, subacromial space on AP and Y- views, acromial anterior and lateral downsloping) and MRI (shape, slope, spur, osteoarthrosis, os acromiale) were recorded. Radiographic and MRI findings were compared and correlated with rotator cuff pathology on MRI. Inter-reader analysis was performed. A total of 140 MRIs from 137 female patients were included. No significant correlation (p > 0.05) existed between acromial parameters and rotator cuff tears, except for a smaller subacromial space on the Y view and spurs correlated with subscapularis tendon tear (p = 0.02, p = 0.04). The presence of lateral downsloping on MRI correlated with a smaller lateral acromion angle (p = 0.0002) and the presence of lateral downsloping on radiography (p = 0.0015). Inter-reader agreements were good to excellent (ICC: 0.65–0.89). Subacromial impingement anatomy characteristics have no significant associations with supraspinatus or infraspinatus tears in symptomatic women. Among different measures, supine MRI can be reliably used to identify lateral downsloping of the acromion.